I've mentioned in earlier posts that my father spent his entire career at General Motors. Growing up I was surrounded by GM cars, brochures, swag, whatever. I loved it all. I became fascinated by cars. It's hard to believe now, but as a kid the cars I wanted the most were made by GM. You can blame the economy, poor build quality, high gas prices, whatever, for the failure of the US auto industry. I blame greed. It became more important for the US auto manufacturers to make insane amounts of money than it did to make great cars. The accountants took over and pushed the designers and engineers aside. At some point a lot of people like me lost interest in American cars. When BMW dropped the 2.0 liter engine in their 1600 coupe, they weren't doing anything new. They were doing what the US automakers had done for years; placing a powerful engine in a small car. The US auto industry just wasn't doing that anymore. They were giving us cars like the GM X cars, the Ford Granada, the Chrysler K Car and other similarly boring, but presumably extremely profitable, cars. Guys like me looked around saw the BMW 2002, the Audi 5000 Quattro , the Japanese "Rice Rockets" and liked what we saw. BMW went on to build the "M" cars, Audi the "R" cars and the Japanese stuffed screaming engines into anything that moved. We never looked back at GM, Ford or Chrysler. 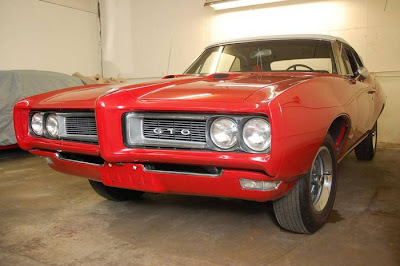 The Pontiac GTO wasn't the greatest car ever built, but it was a car that was (and to collector's, still is) desirable. It was fast, good looking and, most of all, exciting. It was a car people wanted to own. The GTO aura surrounded all of Pontiac's cars. Younger people, not yet able to afford a GTO, bought Lemans' and Tempests and pretended they were GTOs. Older people, whose careers or lifestyles required a larger car, bought Catalinas and Bonnevilles and waited for the day they could trade them in on a GTO. Back then Pontiac really did "build excitement". Pontiac will be gone soon, it's one of the brands GM is shedding in hopes of reorganizing the company. It doesn't matter. Pontiac stopped building "excitement" a long time ago. Which brings me to my point. The US auto industry will never survive on just electric Chevys, hybrid Fords or Fiat designed Chryslers. It needs to "build excitement" again. It needs to build cars that people desire, cars that people aspire to own. If it doesn't, the US auto industry dead. Click here to read the history of the Pontiac GTO.